The Disestablishment of Paradise begins with a clever, slightly precious introduction: the sort of introduction that serves to demonstrate the writer knows what they're doing. Framed as an author's note, it reveals that the text to follow is the biography of a biologist, Dr Hera Melhuish, "the last human being to escape from Paradise" (p. 1). It runs through the salient facts of her experience, thus turning our interest in the novel-to-come from what happened to how it happened and why. It establishes the author-outside-the-text's attitude to science fiction. "We are not writing a textbook" (p. 6), says Dr Melhuish, and thus various conveniences of language will be applied, such as describing the life-forms on Paradise as plants, when in reality we are to understand that—as products of an entirely novel biosphere—they are no such thing. It promises a degree of formal creativeness, referring us to "selected documents" at the back of the novel for further context. And it closes by establishing a clubby tone, conjuring an image of two women talking animatedly for days and nights, in a crowded and messy studio, with wine. "I hope," the narrator says, "you will think of this homely image when the going gets hard, and we retreat from the comfortable and human" (p. 7). It is, all in all, an introduction that promises much, and seems to demonstrate the skill needed to deliver. If it is also an introduction that can be read as evidence of authorial self-consciousness—a faint whispering, I want to make sure you know what I'm doing —well, that is understandable. The Disestablishment of Paradise is Phillip Mann's first novel for over fifteen years, meaning that to a lot of readers, this UK-born and New Zealand-resident writer will be a new name. He is new to me—the last time he released an SF novel, I was sixteen, and my attention was focused on the Interzone generation—so of course I turn to the SFE for context. If their summary of his career is anything to go by, in many ways the present book is of a piece with Mann's earlier work. "A strong visual and structural sense," check; an interest in human/alien contact, check; an interest in the ecological costs of colonization, check. And in terms of quality? There, alas, I find myself hoping that Disestablishment is an outlier. The central problem, perhaps, is also right there in the introduction, which reveals that our narrator, Olivia, is a children's author personally selected by Dr Melhuish; we are cautioned that as a result we may find their style "slightly old-fashioned," although in a letter Dr Melhuish states, "that to me is an advantage, as is your gentle wit" (p. 4). In practice, the voice seems more childish than aimed at children. It is dismayingly certain about the solidity of categories that are better understood as fluid and fuzzy: a stance that is most damaging when it comes to matters cultural and ecological. A brief synopsis before we get down to it. We start at the point where Dr Melhuish—or, as we quickly come to know her, Hera—is director of the Observation, Regeneration and Botanic Expansion (ORBE) project on the planet of Paradise, a couple of centuries after initial settlement. The name has proven overly optimistic. For purely economic reasons—the colony simply is not self-sufficient—the decision has been taken to disestablish, meaning the systematic removal of all human personnel and traces. Hera has a deep attachment to Paradise and protests, but is unable to do anything to change the decision. After some maneuvering, she does manage to swing a final research stint, staying on the planet until the very last systems have been dismantled. Most of the novel describes this sojourn—intended to be a solo project, although before too long she's joined by one of the disestablishment workers, Mack—including treks across the planet, encounters with various native bio-forms, and so forth. And, as Olivia promises at the outset, the novel is a labyrinth, a path for us to walk towards understanding. By the time we turn the final page, we understand what kind of planetary consciousness Paradise represents, and how it has been wounded by the presence of humans. And we feel its pain. After such careful scene-setting, it's startling to discover just how cack-handed Mann's rendering of human interaction can be; it makes the novel's opening movement, which deals with the politics of disestablishment, almost unreadable. The first thing that strikes you is the dialogue: "Be there in a mo" (p. 17); "Don't play silly buggers" (p. 18); "We've got a battle on our hands, sunshine" (p. 18): this is the artificially cozy language of contemporary middlebrow drama, not the vernacular of no-nonsense exoplanet colonists hundreds of years hence. The second thing you notice is the shallowness of what is a superficially diverse roster of characters. To judge by the names, for instance, the cast includes people of Maori, Arab, Jewish, and Russian descent, but Mann shows little to no interest in the lived experience of any of these identities, or how such diverse backgrounds might actually rub along. Emblematically, a post-disestablishment celebration is uncomplicatedly Western middle-class indulgence, "with streamers and balloons as though it were Christmas, and . . . a big cake" (p. 111). It leaves the whole affair feeling curiously weightless, a mechanical necessity before the real wilderness business of the novel begins, rather than inherently dramatic. There is a sense in which these characters are getting off lightly, however, since the one human lens Mann does pay attention to is gender, and while again the set-up is promising—there are multiple female characters the narrative tells us are important, powerful, and capable actors—the results are infuriating. Almost any criticism is gendered, even between women ("You stupid, stupid, stupid woman!" [p. 32], a colleague tells Hera), even Hera's self-criticism after a particularly impulsive action ("What fools we women are sometimes!" [p. 40]). Relationships are, of course, a minefield. Hera's acknowledgment of half-understood feelings for Mack begins with the confession that she's "too clever," because "being clever is . . . not allowing someone else to be right" (p. 220): the male ego must be preserved. Once the relationship is underway, it completes her, at least in Olivia's view: "this was Hera, the woman, awake and enlivened" (p. 362). Most tellingly, for me, when Hera comes to an understanding with a (female) spaceship captain, Olivia tells us "they shook hands like men that had brokered a deal" (p. 85). They are, of course, literally women who have just brokered a deal, in a world where every explicit worldbuilding statement is telling us this is commonplace: yet absurdly old-fashioned assumptions about gender roles constantly infect actions that have no need for them, like that handshake. It means that Olivia's narrative voice is a mess: she writes quite engagingly at times, but she does not write like a native of the world she describes. The larger framework of The Disestablishment of Paradise is more successful—Mann is in firm control of his fictional-biography conceit, and creative in his uses of it, switching fluidly between passages of pure dramatization, authorial commentary, and transcribed interviews between Hera and Olivia. Indeed more SF novels could stand to be as creative with their form. The dozen "supplementary documents" at the back of the book are not merely a clever way of providing additional texture (ranging from the mildly interesting to the essential); they contain some of the most interesting sentence-by-sentence writing in the novel. Particularly worth reading are the short stories nominally excerpted from the Tales of Paradise collection attributed to Sasha Malik, a daughter of settlers whose authorial voice is earthy and challenging, who seems much more able than Olivia to convey a sense of the "raw life" (p. 474) of Paradise, and whose tales develop a fascinating tension with some of the "facts" stated in the body of the novel. But the documents are lively sidebars only. Back in the main narrative, although everything becomes more readable once Hera and Mack don't have to interact with other people, the novel's ecopolitics quickly become as frustrating as its gendering. At first glance there's a pleasing complexity to the depiction of Paradise. Classically wilderness is troped in one of two ways—either as a site of primal ecological grace, a prompt for humans to lament their fall; or as an untouched canvas, awaiting humans to provide meaning. Mann balances the two approaches rather well. Paradise has its own state-of-being before the colonists arrive; the colonists attempt to adapt the planet to their needs, rather than vice versa; these actions are both a fall, and an inscription of meaning that changes the nature of the shaping worldmind—into something darker and more dangerous. And it's particularly unusual for the focus of the encounter-with-wilderness to be a woman—indeed, Hera's encounter with the worldmind is perhaps the closest The Disestablishment of Paradise comes to queerness. Of her first contact, when Olivia asks if she heard a man's voice, Hera replies: "Yes. No. Not really. But not a woman's voice either. But I know what you are driving at. It was deeply sexual" (p. 156). And yet, and yet. The further the novel progresses, the more Mack starts to supplant Hera as the primary contact with Paradise. She makes first contact, but it's his psychic talent that allows them to understand and survive the changing world; and, ultimately, it is Mack who remains and merges with the worldmind, while Hera returns to Earth. Mack's encounter with the wild, in other words, is deeper and more transformative than Hera's, and Mack is so profoundly masculine a character—emotionally reticent, but good at doing practical things with his hands; watching him at work, Hera admires him "taking full pride in his strength . . . primitive and casual with his beauty" (p. 318)—that this turn of events can only really be read as a reassertion of the conventional gendering of ecological narratives. More than this, by insisting that the Paradise worldmind is not just alien, but has no real agency of its own, that it only passively reacts to the impulses of the colonists, The Disestablishment of Paradise presents nature as an idealized otherness that humans cannot help but corrupt. Put another way, Mack can only become part of nature by leaving humanity behind and becoming something else entirely. This is a superficial bleakness that tells us nothing about how to live sustainably as part of a world: once again, the novel's categories are too solid to tell us much about the real choices we have to make. I have a visceral dislike of the genre criticism pose that insists everything was done better decades ago, but the megatext does loom particularly large in some cases; and when you know there's a comparison that many people will have made after the third paragraph of your review, it deserves to be addressed. Ursula Le Guin's "Vaster Than Empires and More Slow," from way back in 1971, is, like The Disestablishment of Paradise , a tale in which humans (explorers rather than colonists) encounter a planetary plant-based consciousness. In both cases, the encounter causes shock and distress. But where Mann idealizes his worldmind, Le Guin complicates hers; where Mann focuses heavily on a prototypical heterosexual couple, Le Guin lightly establishes a complex group dynamic; and where Mann begins to heal his planet by injecting it with a confident masculine ideal, Le Guin offers hers only a profoundly unstable and alienated empath. 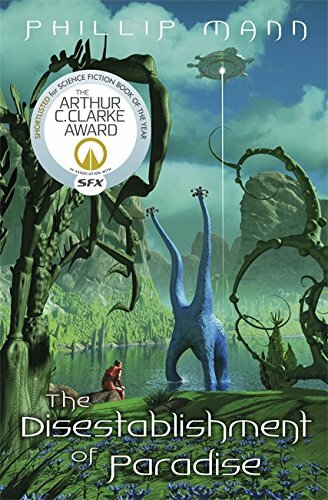 Lord knows our field could do with more science fiction novels structured around the experience of women, and I'd argue that a contemporary body of passionate environmental SF is needed nearly as urgently; but where Le Guin's tale is layered with nuance and complexity, at every turn Mann betrays The Disestablishment of Paradise with rigidity and simplicity. It does more harm than good.